This week on Flashback, we bring you the journey of an actor, director and producer Subhash Ghai, who has rocked the box office for a very long time with a nearly impeccable track record by a string of hits. Subhash Ghai was born in Nagpur in a Punjabi family. His father was a dentist who practised in Delhi. Subhash did his higher secondary in Delhi and thereafter graduated in Commerce from Rohtak, Haryana. In 1963, he moved to Pune, Maharashtra, to join the Film and Television Institute of India (FTII). In 1970, he married a girl from Pune named Rehana alias Mukta. He got married even as his career was yet to take off. Ghai started his career in Hindi cinema as an actor with some small roles in films including Taqdeer, Umang and Aradhana. Despite trying to make it as an actor Subhash Ghai was drawn towards the entire aspect of filmmaking from story development to scripting to direction and so despite having no experience even as an assistant, he got a film to direct. The film was Kalicharan and Ghai’s script had been rejected by seven producers until it came to N N Sippy, who decided to give him a chance. Ajit is still remembered for his name Lion in the film as is the chemistry between Shatrughan Sinha and Reena Roy was stark. Two years later he came with the same cast in another film — Viswanath. This film went on the floors 15 days after Ghai conceived the script. Another thriller with again another set of powerful dialogues. Vishwanath was a bigger hit than Kalicharan at the box-office. Soon Subhash Ghai launched his own banner Mukta Arts and launched Karz a story of re incarnation-revenge theme. The film had a very Western look. The songs were a big hit and are played till today. Laximikant – Pyarelal’s signature tune on the guitar is one of the most haunting in Indian cinema and the last song by Subhash Ghai’s fav Anand Bakshi encapsulating the entire plot is simply brilliant. Karz considered one of the best films of Subhash Ghai today did not do too well but despite that in 1982 he got Dilip Kumar and Shammi Kapoor to work with him in Vidhaata. The young roles were played by Sanjay Dutt and Padmini Kholapure. The film is known for its excellent dialogues. It was the next film, Hero that established his banner. 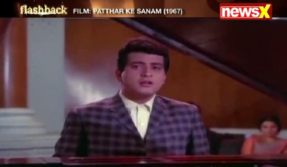 Another evergreen musical blockbuster ‘Hero’ interestingly owes part of its existence to Kamal Haasan. Sick and tired of chasing the Southern Superstar for dates, Ghai decided to scrap the project and came up with the idea of Hero. Jackie Shroff hit the screen as a hero, though he had a small appearance in Dev Anand’s Swami Dada earlier. This was Meenakshi Seshadri’s second film and established her as a star, actress and dancer. Recipient of many national and international awards Subhash Ghai today lives in Mumbai with his wife, Mukta Ghai and his daughters, Meghna Ghai Puri and Muskaan Ghai. The ultimate showman of Hindi cinema is still very active. For more Entertainment and stories watch Flashback on NewsX every weekend on Saturday at 09:25 AM and 11:25 PM and for a repeat show on Sunday at 03:25 PM.